My boyfriend and I visited Bruges last Friday as a treat for my birthday, which was that day. We had visited a couple of years ago, but I hadn’t really paid much attention to the needlecraft heritage of the town. Inspired by the tips from a recent edition (no. 147) of ‘All Stitched Up!’, Inspirations Magazine’s weekly newsletter, I thought it would be a great day trip for my birthday. Bruges is famous, needlecraft-wise, for its bobbin-lace. If you are interested in needlecraft and lace, in particular, The Lace Centre is a must-visit. The Lace-centre is about a 10-minute walk from Bruges’ town centre. 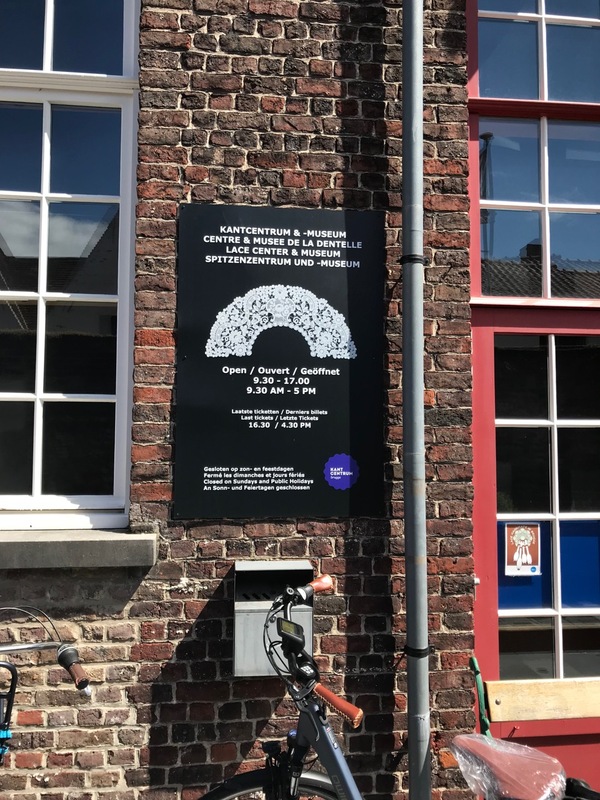 It is not a very large museum but it shows some unique pieces from the Bruges collections and explains the history of lace in Belgium and Bruges in particular. It also has some interactive displays, where you can try out bobbin-lace the digital way! 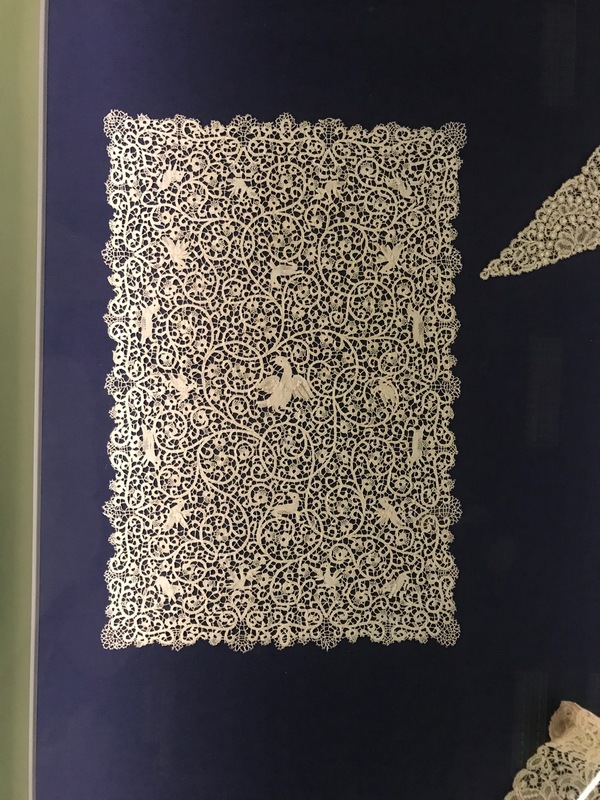 If you visit the museum during the afternoon you are also able to go up to the 2nd floor of the museum where a bobbin-lace craft group meets and you are able to see the ladies work on their projects and ask them questions. The museum also has a very large shop with everything you could possibly need or want to make your next bobbin-lace project. They sell a large range of threads, bobbins, patterns, needles etc. Most of which, could be useful for other types of needlecraft too. What I didn’t see was kits, which beginners could by to be able to have a go at bobbin-lace. I thought that was a shame as I would like to have a go, but with so many different items for sale, I didn’t know what to buy. A kit would have been so helpful. I did get two Bruges folders though with lace patterns. 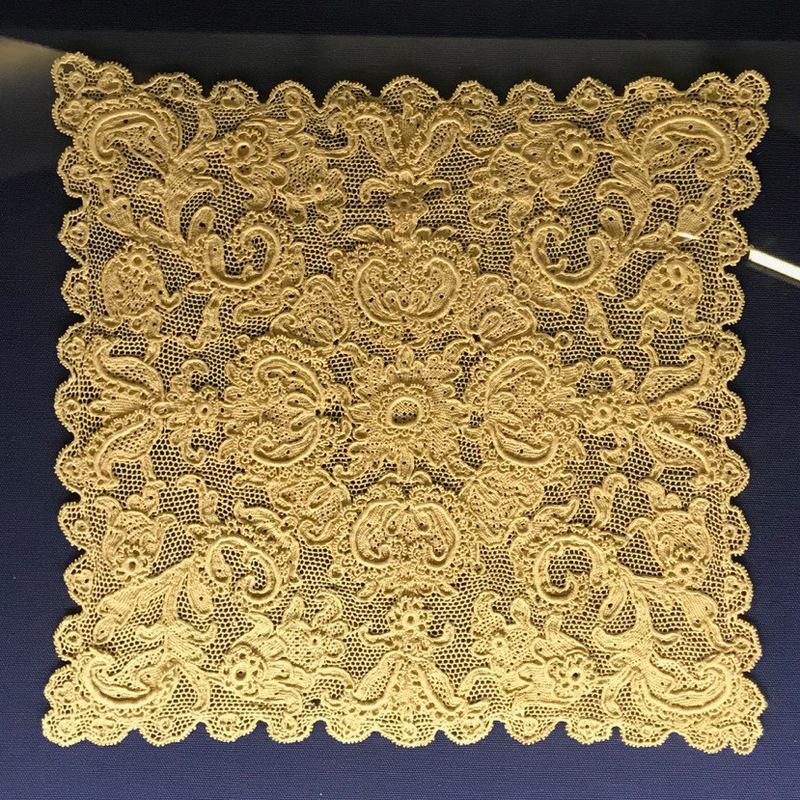 Not to use for bobbin-lace per se, but some would make really nice goldwork patterns too! Before you walk back into town check out ‘t Apostelientje, which is a lace shop directly opposite the Lace Centre. It sells lots of different handmade lace items. It also sells a few threads but its main business is pre-made and vintage lace. 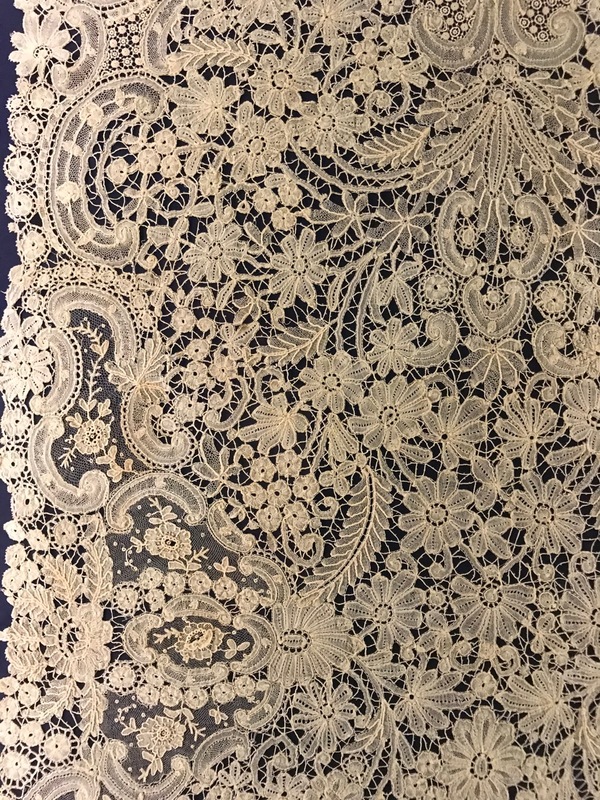 If you are looking for an even large choice of bobbin-lace patterns than the Lace centre has for sale check at the basement of the Brugse Boekhandel. I have never seen a large collection of any type of needlecraft books available in a bookshop anywhere. If you are interested in embroidery and/or cross stitch you have to visit ‘t Handwerk Huisje. It is a large shop which stocks lots of different cross-stitch kits, DMC-threads (stranded cotton, wool, perlé, cotton), sajou items, articles to embroider, needlepoint cushions, and of course items for bobbin-lace. The only two negative things about the shop is that there are ‘don’t touch’ signs everywhere, and that the lady in the shop started shouting the moment I took my Phone out of my bag (as I had typed in the note app which threads I needed) that I was not allowed to take any photographs in her shop! Even though it was recommended in the All stitched up newsletter. I thought Scharlaeken was a disappointment. It is a large shop right near the central market square. They sell embroidery threads and kits but they don’t stock full ranges of threads. They have DMC perlé 3 and 5 on display but only sell about 40 colours so, of course, they didn’t have the colours I needed. The shops felt more bare than well stocked and the member of staff wasn’t very knowledgeable at all. 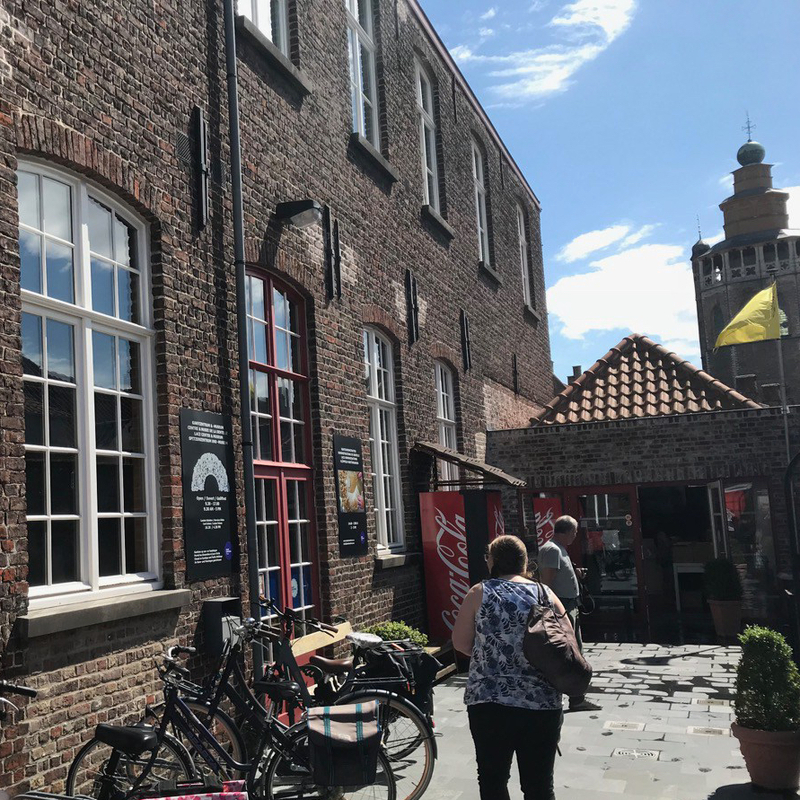 I hope you have enjoyed reading about my trip and that you have maybe be inspired to make your own needlecraft trip to Bruges! Sounds like you had a lovely trip. The lace looks beautiful. I love the lines on them. I’m very interested in the Bruges folders. Are they available to purchase online? 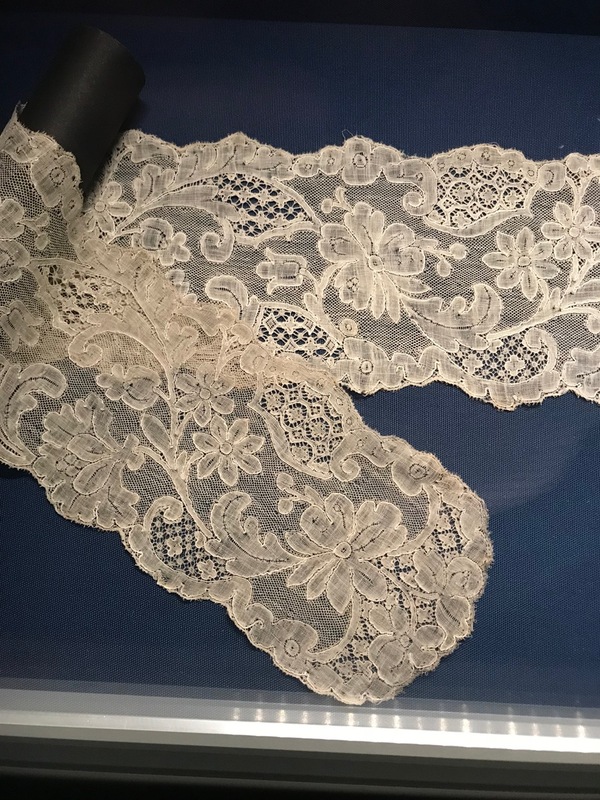 I love the lace, would like to give bobbin lace a try, but I think I would need a workshop to get to grips with the basics. The lace centre has a very extensive webshop. This is the link to the page with all of the books/folders: https://www.kantcentrum.eu/en/webshop/boeken Their website is in English too. I can do you a quick video of the patterns included to see whether you like it. I can pm the video to you on Instagram. I’ll do a video tonight (it is 5.30 pm here at the moment). I do have too many embroidery techniques to learn too, but I just want to figure out how it work, as it seems a mystery with just pins and bobbins! Ill have a look at the kit! I love laces. They are very popular in Finland. Yes, we have those rules in the Netherlands. So if at all possible I try and take pictures without people in them, or without any faces. However, especially when outside in a touristy town that is quite a challenge! Thanks for sharing your birthday treat with us! I admit, when I visited Bruges about three years ago I didn’t even contemplate the possible of needlecraft of any description so I missed all this. The lace museum in particular looks very interesting. It’s a shame about the shops, but you will never know unless you visit! I know, it was the same for me when I visited over three years ago. Glad I had a chance for a second visit! I have never been to Bruges before, but it does sound like an interesting place! I love the interactive lace making exhibit. It was a shame you could not photograph the inside of the Handwerk Huisje, but it does sound great. Thanks for the tour! I always wonder why some shops are so against taking photographs. It is not like there is any copyright issue. I wouldn’t be able to stitch a kit from a photograph of the inside of a shop which has that kit on display! So shops fortunately realize the potential of photographs and social media sharing those pictures! Certainly, it would give them a much wider audience.